« How can I use a controller to detect thermocouple drift? Although I usually check in the BIOS to make sure the serial port is actually enabled, the customer assured me that they’d used the serial port just the day before with other software. So I skipped the BIOS check. I dug into my bag, found a female DB-9 loopback test adapter, and plugged it into the laptop’s DB-9 serial port. A loopback tester directly connects the transmit line (Tx) to the receive line (Rx). In a successful test, any data or characters that get sent immediately echo back on the receive line. So, if a terminal session’s window echoes back any typed keyboard characters, it would prove that the serial port is available and that the Tx and Rx lines are functioning properly. I launched Hyperterminal, pointed it to COM1, and set flow control for no hardware handshake. When I typed some characters on the keyboard, presto, they echoed right back at me, confirming that the serial port was active and not locked by another service or application. The customer’s laptop already had several SIMATIC Manager ‘projects’ that included the setup for network communications over a certain PC comm port with an associated field instrument. From the Manager’s Process Device Network View, I checked two of the projects, but changed no settings. Both were properly setup for a Modbus RTU connection on COM 1 at 115K baud, and configured as 8-N-1 (8 data bits, no parity, 1 stop bit). The network correctly included a MultiRanger 100. Note: A field device, like the MultiRanger, won’t appear in a PDM project unless its electronic device description (EDD) file exists in PDM’s library and is called through the project settings. The Siemens MultiRanger 100 has both an RS-232 port (index 1) and an RS-485 port (index 2), each with its own serial setup. Using a Siemens infrared handheld programmer, I checked the RS-232 port and found that it was properly configured for Modbus (as opposed to the older Dolphin protocol), 115k baud, and 8-N-1. 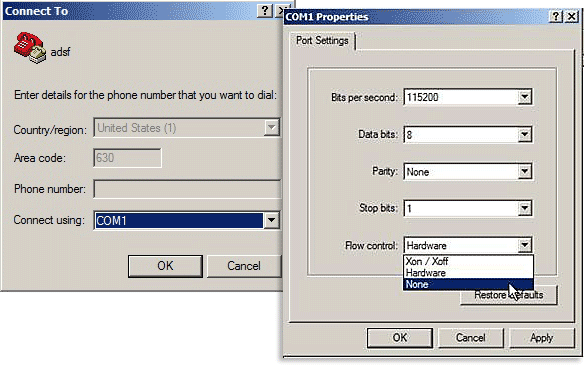 I disabled the parameter that allowed for a phone modem. The table here is valid, except that the Index value is 1 (RS-232) in all cases, not 2 (RS-485). I removed the loopback test adapter and reconnected the laptop to the MultiRanger 100 with the “known good” serial cable. From an open project, I launched SIMATIC PDM, told it I was a specialist user and it came up with its standard MultiRanger 100 screen. I clicked the upload button to load the MultiRanger’s parameters into PDM. It worried a couple seconds and then gave a succession of the dreaded “No Communications” errors. I won’t go through all the iterations I attempted over the next couple hours, but there were many. I did manage to connect to the MultiRanger 100’s RS-485 port using my own laptop and a USB/RS-485 cable, proving that the Multi’s Modbus was functional. But neither my laptop nor the customer’s laptop would connect to the Multi’s serial port. At one point, using Modscan 32, I tried polling a Modbus register on the Multi’s serial port and it too failed. That’s when I retrieved my “known good” HydroRanger 200 from my car. It uses nearly identical PDM Modbus communications (its EDD file is slightly different than the MultiRanger 100’s). I tried to connect to the Hydro 200 with my laptop, but the connect attempt failed. That was a major red flag. The connection had worked the previous day. This time however, I was using the salesman’s known good serial cable, not my own. So, I grabbed MY “known good” serial cable. A minute later I had a valid connection from my laptop to my Hydro and minute after that, there was a valid connection from the customer’s laptop to his MultiRanger 100, each using my known good serial cable. Conclusion: All that grief caused by a faulty “known good” serial cable. The post mortem showed that the customer’s original serial cable’s RJ-12/DB9 adapter was manufactured incorrectly (or at least differently than others of its kind): the black and the blue wires were reversed. The Multi/Hydro adapter needs the black wire on the DB-9 Pin 2, but the adapter’s Pin 2 was blue on that particular faulty adapter. A little further testing showed that though the 6-pin RJ-12 cable was fine, the salesman’s serial cable was more than 5 years old and had become intermittent. I’ve messed with it: it works on rare occasions, most times it does not. If I’d done that, the cable would have failed the loopback test and pointed out the bad cable immediately. Because of my oversight, I mucked around for a couple hours until I had experimented enough to discover the bad serial cable. A loopback test adapter can be made from a DB-9 connector. For serial communications like Siemens’ SIMATIC PDM, hardware handshake connections to RTS and CTS are not needed. Just solder a wire from Pin 2, Tx, to Pin 3, Rx. There are five pins across the top row on DB-9. Be sure to get 2 + 3, not 3 + 4. The pin numbers are always molded into the base, but it takes sharp eyes, youth, or good bifocals (and sometimes a magnifying glass) to see them. Male solder pin DB-9 connector (left), Female solder pin DB-9 connector (right). Click the images to buy them online at RadioShack.com. I also recommend having a pair of gender changers so that DB-9 connectors can be adapted for either male or female DB-9 connectors. They cost less than a buck each at Monoprice.com and can be lifesavers. Male DB-9 gender changer (left), Female DB-9 gender changer (right). Some people will take a straight-through serial extension cable with a male DB-9 on one end and a female DB-9 on the other, and cut the cable in half. Then they’ll connect pin 2 to pin 3 on each of the halves and end up with two loopback cables, one with a male connector and the other with a female connector. The moral of the story: Known good isn’t always enough. Test everything! My Siemens infrared handheld programmier is missing. What do I do? Now it’s your turn: What was the error you learned the most from? And how has it changed your approach to testing and troubleshooting? This entry was posted on May 24, 2012, 10:05 am and is filed under Communications, Configuration, Level, Level Technology, Serial, Siemens, SIMATIC PDM, Troubleshooting, Ultrasonic. You can follow any responses to this entry through RSS 2.0. You can leave a response, or trackback from your own site.